You're a couple of miles into your first road race and suddenly you are faced with a row of tables, water jugs, and volunteers. It's the aid station – what do you do now? Successfully running through the water stops in a road race is a common fear among new runners. Some runners walk through them because they don't think they can grab and drink water on the run. But if you know what to expect and how to take and drink the water, you'll look like a pro as you run through the water stops. Study the course map before the race, so you have a general idea of where the water stops will be on the course. They should be marked on the map. 1. Pay attention during the race, so you can see when there's a water stop coming up. Sometimes there will be a sign alerting you to an upcoming water stop. 2. Don't go to the first table at the water stop. That's where all the rookies stop and, if it's a big race, it's going to be very congested. Keep running to one of the tables farther down. If there are tables on both sides of the course and the water station is crowded, go to a table on the left side. Since most people are right-handed, the tables on the right tend to be much more popular. 3. Sometimes volunteers hand out the water cups and other times the cups of water will be left on tables. If volunteers are handing out the water, run toward them. Taking a cup from a volunteer will save you time and keep you more in the middle of the road, so you don't get caught in the congestion around the tables. 4. Try to make eye contact with the volunteer so he knows you're coming for his cup. Stick out your hand several feet before you reach him. Wrap your hand around the cup and pull it from the volunteer's hand. Don't forget to say, "thanks" before you run off. 5. Once you take the cup, don't be tempted to gulp it down quickly. Squeeze one side of the top of the cup, so it's pointed, like a V. If the cup is very full, this will allow some extra water to come out, so it's not spilling all over the place. And holding the cup at the top like that will help keep the rest of the water in and allow you to drink the water slowly and not get it up your nose (a common fear among beginner runners). 6. Try to keep running and go with the flow of runners. If you feel like you need to stop or slow down to drink, pull off to the side. 7. Put the pointed top of the cup in your mouth and drink the water. Take your time – there's no need to drink all of it in one sip. 8. Many races have garbage cans or boxes after the water stops. Try to toss your cup in there, if you can. 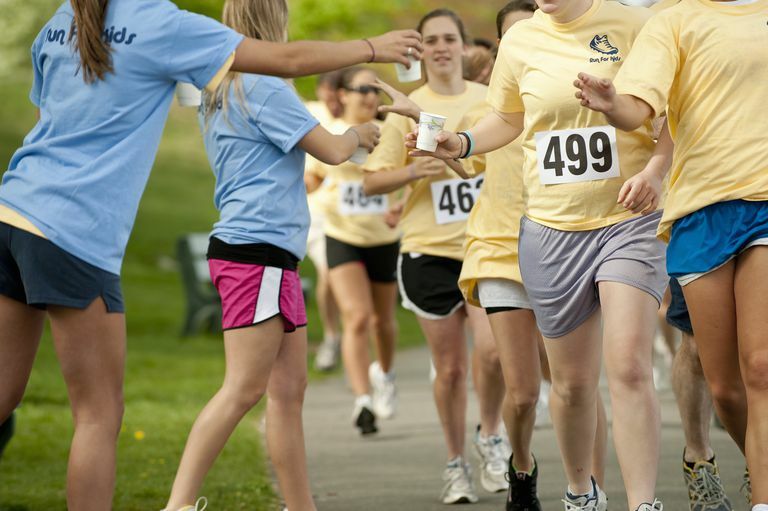 It's also fine to throw your cup on the ground – just make sure you don't hit a spectator or another runner with it. Try to drop it straight down – don't throw it across and potentially hit or spray other runners. And try to toss it where other runners can't trip over it.